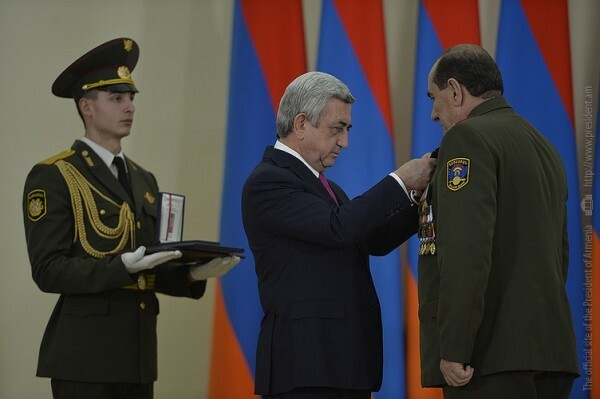 On the occasion of the 25th anniversary of the creation of the Armed Forces of the Republic of Armenia, President Serzh Sargsyan awarded over two hundred military servicemen and freedom fighters with the highest awards of the Republic of Armenia, medals and orders, and bestowed on them high military ranks for the courage manifested in defending the borders of the Fatherland, valor, boundless dedication, as well as for their contribution to the army building and enhancement of the battle readiness of the troops. The President of Armenia congratulated the servicemen and the freedom fighters on the occasion of the holiday and on receiving high state awards. I congratulate you on the occasion of the Army Day and on the receiving the Fatherland’s high awards and ranks. We are grateful to you for the enormous work you have done and which is called the service to the Fatherland. First, we shall commemorate those immortals who are being awarded today posthumously. We, as a nation, stand by the parents who raised these heroes and send to their families the words of compassion and support. Those boys fell defending their families, their friends and us all. They fell so that Armenia can live, so that aspirations of our people live on and become a reality. They became immortals and together with us will continue the millennia-long and incessant march of the Armenian nation. I congratulate those present in this hall and those who in our Armed Forces carry on with the dedicated work of their fallen brothers in arms. Be aware that the Fatherland trusts you and believes in you. We are proud of you; you are the worthy sons of our nation, the power and reliance of our people,” said President Serzh Sargsyan. In the presence of the particiapats of the official award ceremony, the President sent his congratulatory message to the people of Armenia on the occasion of the Army Day. I congratulate you on the occasion of the Army Day and the 25th anniversary of the creation of the Armed Forces of the Republic of Armenia. The Armenian Army was created along with the reestablishment of our statehood. However, the formation of the Army started earlier, and it started not from the top but from the bottom, spontaneously, through the instinct of self-defense of the people. Hideous events, which had taken place in Sumgait, Baku, and other places in Azerbaijan, awaked our historic memory with the blood-chilling pictures of massacres and forced deportations. Formed spontaneously but deeply consciously the voluntary movement and first units of volunteers had become the axis on which the glorious and victorious structure – the Armenian Army would rise. We, as a nation, had united. Last time, we had been united like this at Sardarapat. The superior resources of the foe did not scare us. On the contrary, that fact made us serious, organized, and focused. Our Army was formed at the battlefield. We were fighting agains the enemy literally inside our own home. I recall a true story: a man with the arms in hands was fighting the enemy in his own home. He fought and retreated from the doorway to the kitchen, then still fighting he retreated to the living room, then he took back his kitchen and his doorway. This is not an allegory; this is a true story from the heroic battle of Karintak. The war imposed on us, made us all the Army; this is the truth. On the other hand, we need officers - professional, experienced, and deeply knowledgable of the military science. We have been able to smoothly and effortlessly to intertwine the professional capabilities of the military and the strong battle spirit of the home guard. We were aware that the Fidai movement, even if of a heroic nature, had no prospects. The time had come to create a professional army. Military servicemen all over the Soviet Union answering the call of the Fatherland gathered here and carried out that tremendous task. Twenty-five years ago, by the order of Vazgen Sarkissian our Army became a state structure. From that day one, we were fighting in the self-defense war at the state level. From that day on, the new and glorious history of the Armed Froces of the Republic of Armenia is being written. Many of the pages and heroes of that history have already appeared in history books. Moreover, that history has become an indivisible part of our national identity. That history is our self-respect, human and national dignity, the proof of our freedom. I have stressed on many occasions that no military action, to say nothing of a new war can solve the Artsakh issue. Moreover, a new war will become an additional, thorny component of the issue which is complex enough, but not a solution. Events of last April proved once again (and I stress “once again’) to our adversaries that the use of force or threats to use force is a tragic and dead-end road, which means it’s not a road at all. Those events had also proved the vital and crucial importance of the safety zone created around Artsakh. We are not going to fight another elongated war in the doorway and kitchen of our own home, we have done it already. The blood of our martyrs is the price we have paid for our freedom and our future. Today, the thankful generation is bowing to the memory of our immortals and continues with honor the patriotic work of their grandfathers and fathers. Today’s servicemen and conscripts, now with new structures and new weapons, continue to improve and develop, continue to be the unswerving shield for Armenia and Artsakh. Currently, it would be hard to find a stronger defender and a more ardent proponent of peace that the Armenian Army. Next twenty-five years will be a period of a new qualitative rise for our Army. Officers, as a special stratum of our national intelligentsia, will have a greater public standing and weight, will have a greater professional, including technological, efficiency. For the conscripts, the military service will truly become a school of life, starting from the military skills and up to civil and psychological readiness. The 25th anniversary of the creation of the Armed Forces of the Republic of Armenia is a great holiday, a great holiday indeed. I once again congratulate us all and wish courage, indestructible resolve, and peace.